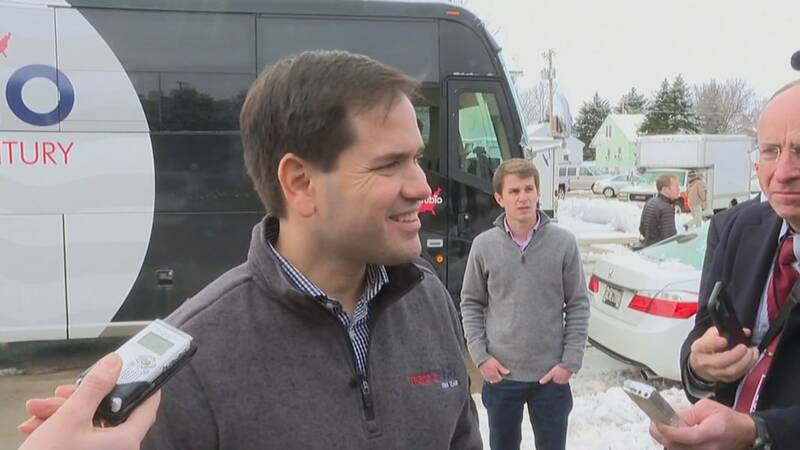 WATERLOO, IOWA -- Courting conservatives in this critical early state, Marco Rubio pledged this week to put “the weight of the presidency” behind a Constitutional Convention to pass term limits on members of Congress and Supreme Court Justices, and to pass a Balanced Budget Amendment. The proposal was a new but constant addition to Rubio’s stump speech as he made one last swing through Iowa before the year ends — he mentioned it again at every stop on the two-day swing. And it’s one that could help distinguish him from the field as he makes his pitch to conservatives in the Hawkeye State. Of the current slate of GOP candidates, only Rubio and Mike Huckabee have endorsed the proposal Rubio backed this week, known as the Convention of States Project. Ted Cruz, whom many see as the strongest contender to win the Iowa caucuses, hasn’t yet backed the proposal, though he’s touted it previously as evidence of how fed-up the grassroots are with Washington overreach. Rubio has long faced skepticism from conservatives over his record on immigration reform and his more hawkish stance on foreign policy. But Mark Meckler, president of the group advocating for the Convention of States project, said his support for the proposal “has the potential” to win him conservative support. “This is an election, very clearly, where the grassroots are rejecting Washington and the status quo. Washington D.C. can’t fix itself — the people have to do it,” he said. Rubio’s support for the proposal “elevates the debate on the issue significantly,” he said, and "will be a game-changer” for his campaign, Meckler — a former Tea Party leader — said in a Twitter post. His endorsement also drew the notice of influential conservative talk radio host Mark Levin, an advocate for the convention, who tweeted out Rubio’s announcement and asked if other candidates would follow suit. It does, however, mark a shift in tone from the senator on the issue — he took a more cautious approach to the prospect during a New Hampshire town hall in October. “Just make sure that we know how it is going to turn out because if you open up the Constitution, you are also opening it up to people that want to reexamine the First Amendment, people who that want to reexamine the Second Amendment, people that want to reexamine some other fundamental protects that are built into the constitution,” Rubio said then. Still, Rubio’s pledge to put the “weight of the presidency” behind the proposal is by no means a promise it will happen — presidents have no power over such conventions, and Meckler said it effectively amounts to use of the bully pulpit. It’s unclear, too, whether the pitch will resonate with voters, many of whom at his Iowa town halls said they were intrigued by the idea but didn’t know much about it. Still, others — like Mary Clark, an elementary school teacher from Ames, Iowa at Rubio’s last campaign stop on Wednesday — said the proposal hit at exactly the right solution to government overreach and excess. "He’s right,” she said. “I think that needs to happen. It's come to that point"